The last time the Mexico men’s national team played at Estadio Azteca prompted the usual whirlwind of matchday emotions. The joyful enthusiasm of the starting whistle, yet again tantalizing hundreds of millions of us with unbridled possibility. Maybe this is it. Maybe we’ll look back on this day as the beginning of a new era. One in which our stubborn passion for fútbol finally conjures up international accomplishments worthy of our screams, our songs, and our occasional tears. But before long, the opposing goalie was holding the ball. I tensed up as a rumbling surged through the crowd “Ehhhhhhh…” I went into the kitchen, got a refill I didn’t yet need, and nervously fidgeted with a bag of extra-hot chips. But there wasn’t enough room in my New York apartment to escape the chant that came next. It was as clear as ever. A hate-filled word that has become, for some, a misplaced cultural act of defiance. I breathe Mexican soccer. It binds me to my father, to my community, to my past. And while my fear of flying objects meant that I was never going to be much of a soccer player, I became an ardent observer of the game. I provided commentary during matches and screamed in exasperation when a winger missed his mark. I knew this was not how little girls in rural central Mexico were meant to act, so I screamed louder. The two hours of an important international match were pure magic in my town. The streets were empty. You could feel everyone around you making the same wish. Sure, it would be great if our collective dreams were about more than a ball going into a net, but it’s a special feeling nonetheless. And when the ball finally did go in, I would join the other neighborhood kids in a loud, celebratory sprint around the block. The now infamous chant is nowhere to be found in my childhood soccer memories, because it didn’t exist. Hearing some fans defend the chant, you would think it was shouted by Moctezuma as he rode a sombrero-clad eagle to meet Cortés in battle. The reality is far less interesting. The chant, in its current form, is believed by some to have started in Guadalajara in 2003, when it was used to insult a goalkeeper who had joined a rival club. 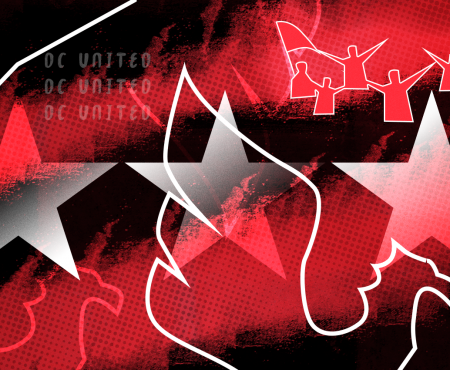 By 2014, the chant had spread beyond Mexico, including to MLS, and had drawn ire from thousands, while thousands more had leaped to its defense. During a World Cup match my husband angrily voiced his disgust with the chant. While we had both previously discussed our frustration, the tone of his voice this time elicited an unexpected, instinctive reaction from me. I, a straight, cisgender, self-declared ally, felt ashamed at my reaction. Yet I also felt attacked. How condescending, I thought. He’s speaking about a word he only recently learned, in a language he does not speak, from a country he does not understand. “Well, it’s not quite that simple,” I sputtered. So he asked me to explain. I couldn’t. At its most literal level, the word means male prostitute. It is not hard to see how it came to be a homophobic slur that also evolved to mean “coward.” Growing up, I knew it primarily as a qualifier, used in the way one might use a certain English word that rhymes with ducking, to describe something unpleasant, something broken. It has been used in many different contexts and I cannot pretend to know what each chanter is thinking as he or she screams, but the hateful way in which the word is regularly used is undeniable. As opposition to the chant has intensified, FIFA, CONCACAF, and the Mexican Football Federation (FMF) have been forced to take action, launching educational campaigns, levying fines and threatening harsher punishments. In June, FIFA announced that it had given referees at the Confederations Cup the power to suspend games over discriminatory behavior, a category that would clearly encompass the chant in question. And yet to date the success of these measures appears to be limited, or inconsistent at best. On June 15, ESPN’s Mexico website launched a survey asking fans whether they would continue to use the chant knowing what it could mean for Mexico at the Confederations Cup. 69% percent of survey takers answered that they would. The chant was largely absent from the Confederations Cup and FIFA’s resolve to follow through on its warnings went untested. However, just a few weeks later, the chant was back at the Gold Cup. It was also heard at the MLS All-Star Game in early August. And it remains to be seen whether we will hear it again at the Azteca when Mexico plays Panama on September 1. Why this irrational insistence on the chant? To some Mexico soccer fans, the chant has, unfortunately, become an act of resistance against a perceived attack on their traditions by outsiders, particularly Americans. Stopping the chant is not the only important effort that has fallen victim to this resentment. On June 5, the Los Angeles Times published an article about efforts to save the endangered vaquita, a small species of porpoise, in the Sea of Cortez. The article highlights how government-backed foreign environmentalists leading the push are viewed as outsiders imposing their priorities on Mexicans. Some fisherman go so far as to question whether the vaquita is even real, or suggest that Americans are actually to blame for its demise. I experience this tension regularly in my own personal interactions with my conservative Mexican family. When I suggest that gay couples should be able to adopt, or that my cold was caused by a virus rather than my stepping barefoot on the floor, I immediately become an arrogant outsider. I become an American of Mexican descent who surrendered her values at the foot of the Empire. And I lose what little power I had. This problem may be easier to comprehend within the context of Mexico’s history with imperialism. Colonialism, foreign interventions, and their legacy of uneven relations with world powers, most recently with the US, weigh heavily on Mexico’s collective psyche. It wasn’t long after gaining independence that the country lost over a third of its territory to its more established neighbor to the north. What Americans innocuously call the Mexican-American War, Mexicans know as the US Intervention or the North American Invasion. And while most Mexicans now regard the war as ancient history, it left an indelible mark on their perceptions of the US. There is never any doubt about who has the upper hand in negotiations. A foreign government makes decisions that have a profound impact on Mexico’s economy and security, while treating its immigrants with disdain and failing to curtail the demand for drugs that has wreaked havoc on parts of Mexico. President Trump’s rhetoric since the 2016 campaign has only intensified the resentment. With few avenues available for meaningful protest, many Mexico fans choose to take a misguided, symbolic stand in the soccer stadium, the one space in which their country has historically been superior to the US. FIFA’s willingness to host the World Cup in countries with atrocious LGBT rights records only augments the feeling that the backlash against the chant is an attack on Mexico in particular. Of course, this sentiment is just one of the factors that makes the chant problem an especially difficult one to tackle. It is imperative that we confront Mexico’s own glaring shortcomings when it comes to LGBT rights. While strides have been made in recent years, Mexico remains a socially conservative country where homophobia and transphobia are rampant. In September 2016, marches protesting marriage equality drew tens of thousands across the country, and violence against LGBT people is routinely ignored. The fact that so many soccer fans fail to see a problem with the chant, regardless of what they may or may not personally be thinking when they join in, points to how little regard is given to combating homophobia and, in some cases, how much effort is put into perpetuating it. Liga MX club Tigres recently tried an unconventional strategy that has been working: committing to renovating a school for each home game in which the fans replace the chant with “Ehhhh, Tigres!” Its success has not gone unnoticed. The FMF is now pledging that if supporters change the chant during Mexico’s match against Panama on September 1, it will donate the money that would otherwise be destined for fines from FIFA to education efforts benefitting Mexican children. Initiatives like this can go a long way toward addressing the problem, but more severe measures like docking points and suspending games should also be real options in some instances. If the punishment is harsh enough to impact supporters directly, it’s likely the chant will stop. But the responsibility extends beyond the relevant soccer federations. Those of us who understand the problem must work to make that word unacceptable in a place where many people find an escape from their everyday problems. Some supporters are already making this a priority. I am optimistic that a combination of the strategies described above will eradicate the chant in the near future. What the fines, punishments, school donations, and educational campaigns do not do is ask Mexico to confront its homophobia directly. That is an infinitely more difficult problem to tackle. But the overwhelming scope of the problem should not detract from our determination to end the chant. It may initially be a symbolic step forward, not backed by the reality faced by LGBT Mexicans outside the stadium, but it’s small changes like this that may gradually contribute to making homophobia socially unacceptable. Creating even an illusion that we are better can be a game changer. It reflects an acknowledgement of what is right, and gives us something to strive for. I’m beginning to see this recognition in the younger members of my family, the first with access to higher education and an understanding of the world not strictly dictated by their church. I hope that they will build on the legal strides that have been made and confront hate in their everyday lives. I also hope they come up with clever trash talk and chants that will manage to shock my grandmother while still respecting the existence of every human being. I cannot wait to join in, and I’m willing to forfeit a couple of World Cup qualifying points to help get us there.